Sydney Skip Bin Alternative | 1800-GOT-JUNK? Do you need a large amount of rubbish removed in Sydney? You may be thinking “I’ll just hire a skip bin.” While this used to be the standard way to remove large amounts of rubbish, times have changed. There are many things to consider before hiring a skip bin in Sydney. When hiring a skip bin, Sydney residents generally need to place the bin on private property. If you don’t have enough space or access to your property for a skip truck to fit through, then the skip bin will have to be placed on common ground. To do so, you’ll have to contact your local council for approval and payment (some councils even require it for private property). As the customer, it is your responsibility to check the skip provider’s credentials and the requirements of your particular council. Once legal issues are sorted out, you must confirm who is liable for any damage caused by the bin while it is sitting outside your home--this may include grass or plant damage, concrete/walkway damage, or leaking contaminants down the street or drains. take, which may include mattresses, tree stumps, tyres, and other items that need to be recycled or dismantled. Most skip companies have different bins for different items and won’t accept a ‘mixed load’. You usually have to sort and organise your junk before ordering the skip. Once all the loading has been done, you need to organise the pick-up of the skip and pay any surcharges, then clean up around where the skip bin had been sitting and also any dirt and rubbish dropped between the skip and your property. After all that hard work, make yourself a cup of tea, sit down and promise to yourself not to go through that again. Is there is another way to get rid of your junk next time? 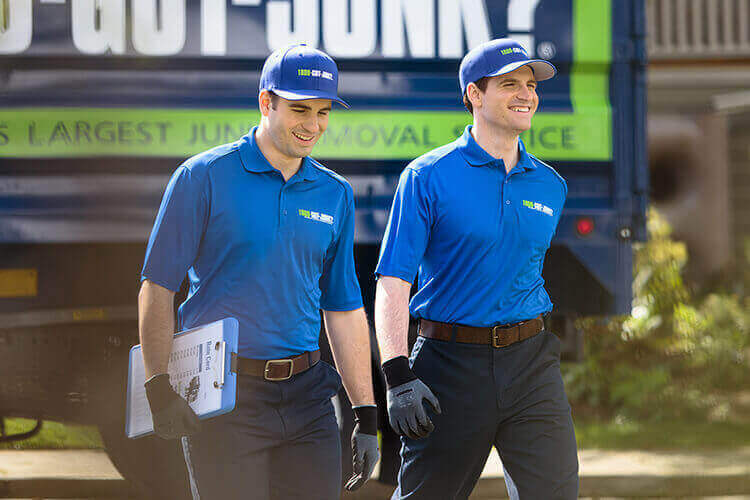 Call 1800-GOT-JUNK? and speak to one of our friendly customer service agents. They will explain that for a load of rubbish would cost around the same as a skip bin if 1800-GOT-JUNK? did the rubbish removal for you--but we do all the work! Just walk the licensed and insured 1800-GOT-JUNK? team around your property, pointing at what you want gone. No need to lift anything yourself, stockpile it to the kerb or call the council for approval. Our friendly, professional crew will carry it out of your home or off your property and load it into our truck. We take many items not accepted in skip bins, including mattresses and tyres, and ‘mixed junk’ is no problem--we sort it all after we take it away. But wait, the job doesn’t finish there--for 1800-GOT-JUNK? team, that is. While you are enjoying getting your space back, we’ll be busy processing as much of the junk as possible to reduce the amount that goes into your local landfill. Junk removal is our business, but so is recycling and donating. For a comparable price, 1800-GOT-JUNK? will get rid of your rubbish within minutes or hours, not days. You didn’t have to lift a finger and you can feel good knowing that as much as possible of your rubbish was diverted away from landfill.